What Makes Carrier a Best HVAC Brand? When looking for a quality heating and cooling brand, Carrier is known for offering top-tier heating and cooling products that are built for lasting performance. The company is known for standing behind their air conditioners and they have been in business for more than 100 years. Installing a Carrier air conditioner comes with a guarantee as all technicians that install Carrier heating and cooling units must be an authorized installer for the brand. Air conditioning installation is no easy job, and Carrier guarantees you are getting a quality HVAC installation by requiring their HVAC contractors to become factory authorized dealers. They require anyone installing their air conditioners to complete the North American Technician Excellence certification course. 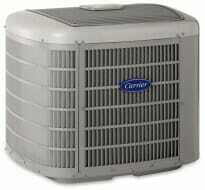 There are quite a few different air conditioning models offered by Carrier. Each one has different benefits and the price tiers are reflected in that based on the size you need and what SEER rating you are wanting for your home. Carrier HVAC focuses on reducing their environmental impact and strives to develop cleaner technologies overall. They’ve been phasing out refrigerants that deplete the ozone since 1994, and have been leading the move away from technologies that are now known to be harmful to the environment for more favorable options. Carrier HVAC’s top-end products are known for coming with a built-in humidifier, something that many other brands are not equipped with. Without a built-in humidifier the air inside a home slowly loses its humidity and becomes dried out. Many homeowners decide to have a separate whole-house humidifier installed to make up for this problem, this is something that many Carrier customers don’t have to worry about. Carrier is known as one of the most reliable options on the market today. The systems come with comprehensive warranties that often cover 10 years of repairs after they’ve been installed. While some products require repairs or even replacements just a few years after being installed, Carrier air conditioners are known for their durability with a great warranty to match. There are Carrier facilities all over the country, and each of them is stockpiled with key replacement parts for your central air conditioning unit, so it’s very common for Carrier repairs to be completed the same day that you call a certified Carrier technician for help. Carrier offers a wide range of heating and cooling products to meet most residential and commercial needs. The company has a variety of air conditioners, heat pumps, geothermal heat pumps, split systems and gas furnaces, depending on what your needs are.